TOKYO, Japan -- Representatives of the Port of Long Beach, shipping line Kawasaki Kisen Kaisha, Ltd. ("K" Line) and container terminal operator International Transportation Service Inc. signed an agreement Monday, July 31, reaffirming their commitment to work together to further international trade and environmental stewardship. 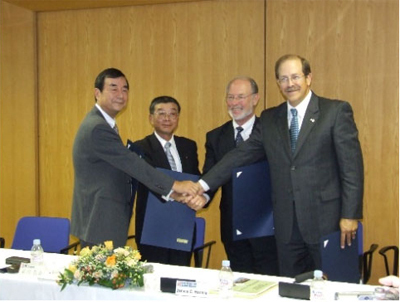 On Monday, a Port delegation led by Long Beach Harbor Commission President James C. Hankla and Port of Long Beach Executive Director Richard Steinke met with "K" Line President and CEO Hiroyuki Maekawa and ITS President Sho Ishitobi in a ceremony to celebrate a June 22, 2006, preferential assignment agreement. The Port, "K" Line and ITS have enjoyed a prosperous and successful working relationship for several decades. The Port-governing Long Beach Board of Harbor Commissioners voted on May 22 to approve a historic "green" lease agreement with ITS that will transform one of Long Beach’s largest container terminals into the most environmentally friendly facility at the Port. "K" Line is the parent company of ITS. "On behalf of the Port’s Board of Harbor Commissioners, I salute ITS and "K" Line for joining us in this strong partnership for environmental responsibility," Hankla said. "This historic agreement is a model for how port terminals in the United States -- and throughout the world -- will operate in an environmentally friendly way." "For "K" Line, protecting the environment is one of our company’s most important responsibilities," Maekawa said. "We are proud to commit ourselves to this innovative plan for a better environment jointly with Port of Long Beach and ITS. This is one of our most ambitious environment protection programs." "K" Line is one of the world’s leading ocean carriers and one of the first shipping lines to adopt its own environmental protection programs. "K" Line has called at ITS’ Long Beach container cargo terminal since 1986. ITS is one of Long Beach’s longest continuous tenants, having opened its terminal in 1972. ITS was the maritime industry’s first terminal to introduce on-dock double-stack train operations, revolutionizing Intermodal trade in the United States. "Our goal at ITS is to provide our customers with the very best service," Ishitobi said. "We also have a responsibility to our customers, employees, and the community to do our best to protect the environment. This "Green Lease" helps us to fulfill our responsibility, and hopefully other terminal operators and the marine industry around the world will do their part to improve the environment." "One of the key reasons for our success at the Port of Long Beach is our close relationship with our customers - some of the world’s greatest companies, companies like "K" Lineand ITS," Steinke said. "Their cooperation in improving our environment has helped to make Long Beach one of the world’s great ports."